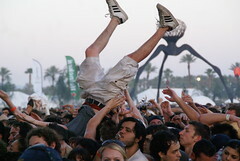 Few events have left me as speechless – literally and figuratively – as this past weekend’s Coachella concert fest. Imagine a polo field in the middle of a desert, crowded by 60,000+ folks who would make the casts of “Alice and Wonderland” and HBO’s “Carnivale” seem colorless — all dancing/raging/lounging to the live music of a potpourri of bands including Lilli Allen, Rage Against the Machine (first reunion in almost a decade) and Red Hot Chili Peppers. Throw in the not-your-average celeb sightings (read: Tommy Lee in pink highlights, Ryan Cabrera in a getup a la White Stripes and folks you recognize vaguely from “The Goonies.”) Add the more glamazon LA fixtures, like Paris H., Mischa Barton, Kimberly Stewart, and Scarlet Johansson (who actually performed) –- and you’ve got quite the surreal landscape for some photo taking. I lost my camera and voice at the three-day festival — but thankfully, I can rely on my fellow Flickr citizens to capture the memories. Photos from ccuttriss, Brian Romero, zombie eater and emayoh.